Kauders, Marie. Vollständiges israelitisches Kochbuch […]. 1896. 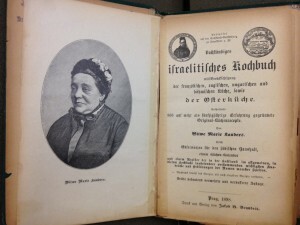 Marie Kauders’ Erstes Jüdisches Kochbuch für böhmische Küche (First Jewish cookbook for the Bohemian Kitchen) was published around 1896 by J. B. Brandeis in Prague. Another cookbook, based on Kauders’ experience running a cooking school, Kochbuch der ersten israelitischen Kochschule (Cookbook of the First Jewish Cooking School), was published by J. W. Pascheles in 1891, also in Prague. Like many cookbook authors, little is known about Kauders’ life other than what can be surmised from her cookbooks: she was a widow with over forty years of cooking experience by the time her cookbook’s second edition was published in 1890. 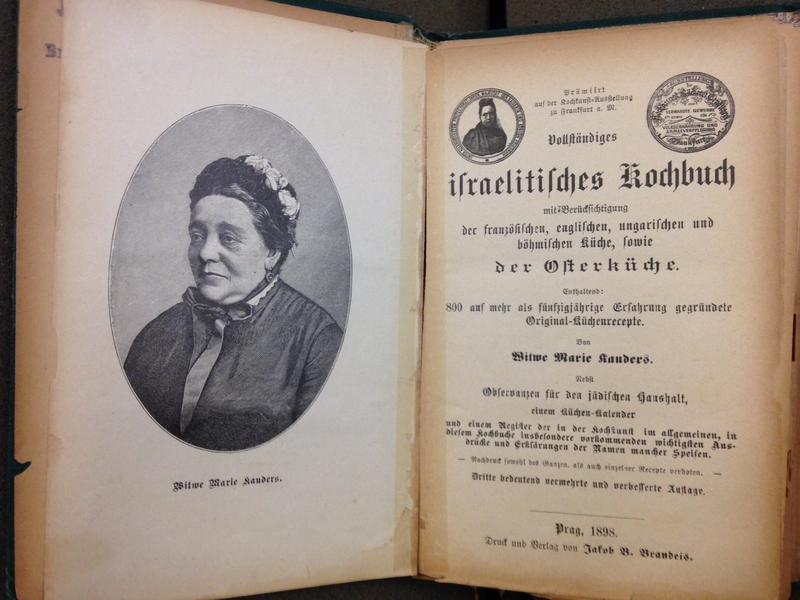 The publication history of her cookbooks is somewhat unclear because of the way their titles vary, but one could assume that her Vollständiges israelitisches Kochbuch mit Berücksichtigung der französischen, englischen, ungarischen und böhmischen Küche, sowie der Osterküche (Complete Jewish Cookbook with observance of French, English and Bohemian cuisines as well as dishes for Pesach) might have been the expanded second edition of her Erstes israelitisches Kochbuch für böhmische Küche. Worldcat listed five editions of her Vollständiges Kochbuch, the last of which appeared in 1918; while the Kochbuch der ersten israelitischen Kochschule had four editions listed, the last published in 1901. There is not much difference between the Vollständiges Kochbuch and the Erste israelitische Kochschule, except that Kauders describes the latter to be in part a kind of textbook for her culinary students in the forward of the third edition; whereas the former is presented simply as a cookbook. What sets Kauders’ cookbooks apart from many others was her emphasis on cooking as an artform. In the introduction to Vollständiges Kochbuch she compares cooks to sculptors who create monuments out of raw materials. She adds that the products of the art of cooking are, like works of art, a true feast for the eyes and are to be treasured because they both nourish the body and invigorate the spirits. Kauders received acclaim at culinary exhibitions in Frankfurt and Vienna (in Frankfurt she even won a bronze medal). After her success at these competitions her cookbooks quickly sold out, requiring further editions. Kauders, Marie. Witwe Marie Kauders’ erste israelitische Kochschule : Vollständiges Kochbuch unter Berücksichtigung der böhmischen, ungarischen, englischen und französischen Küche. Besondere Abtheilung: die Osterküche. Vierte sorgfältig revidierte, bedeutend erweiterte und verbesserte Auflage. Prag : Eigenthum und Verlag von Samuel W. Pascheles, 1908. Library call number r 656.